Come to the Garden Hideaway at Lotus Farm. Experience the Hawaii most tourists never see. This soulful, laid-back slice of paradise is set among three lush and lovingly maintained acres on a mature, established organic tropical fruit farm and palm nursery. We are only a five minute drive from several secluded, pristine beaches and rivers. The Hideaway was created with your every comfort in mind. Your home away from home is tucked away down its own private drive and enclosed in a serene, tropical Asian style courtyard. A comfortable outdoor lounging lanai, under a pergola of tropical vines, looks out over the peaceful meditation garden. The open floor plan and high pinewood ceiling create a sense of spaciousness in the light, airy, charming and tastefully done 500 sq. ft. one room cottage with dining, living and sleeping areas. Our guests rave about the enclosed outdoor shower and bath area that is directly off the indoor 1/2 bath. The cottage is done in shades of apricot, beige, gold and green and decorated with Hawaiian art prints and furnished in bamboo, wicker and rattan. The comfortable king size bed is covered in good quality linens. Plush robes are also provided. The Hideaway comes stocked with goods for a light breakfast. We provide freshly roasted, organic, hand picked Kona coffee beans with coffee grinder and coffee maker, an assortment of teas, sweeteners, whatever types of milk you desire along with organic yogurt, granola, macadamia nuts and fresh fruits in season. The kitchenette area has a refrigerator to store your snacks and takeaway food as well as a bar size sink. Our Home Stay permit does not allow us to provide a stove top, hot plate, microwave or toaster oven for cooking. Guests are welcome to use the Weber Grill in the Hideaway's covered BBQ area just beyond the enclosed garden gate. We provide knives and cutting board, blender, juicer, glasses, dinnerware and silverware for your use. There is a clothes washer and dryer inside the cottage. We are a smoke free environment, inside and out. The cottage comes stocked with yoga mats, beach towels, beach blanket, beach chairs, boogie boards, mask and snorkels, beach umbrella, picnic cooler and shopping bags for your excursions. Our central location is ideal. We are just 50 minutes from the Lihue airport and 35 minutes from the end of the road in Haena, making anywhere on the island an easy half day excursion. The small local flavored town of Kilauea is only five minutes from the Hideaway. There you will find a great bakery, shops, restaurants, yoga studio, pharmacy, post office, gas station and other conveniences. 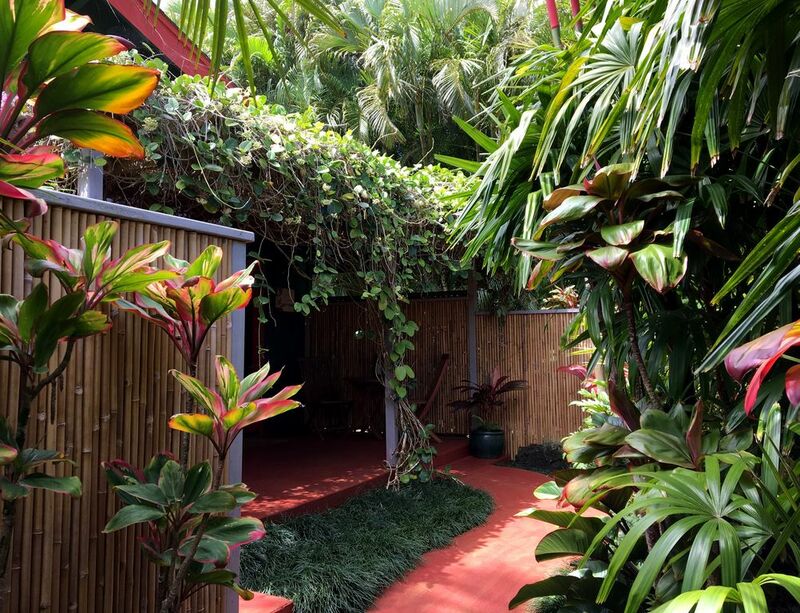 We are longtime Kauai residents who are happy to share our favorite spots with you as well as setting up special requests such as in house massage and other holistic health treatments. We established our working farm nearly 35 years ago. Lotus Farm and Nursery was one of the first organic farms on Kauai. You'll see us around the property working the land and tending the nursery. Our orchards produce macadamia nuts, coconuts, oranges, tangelos, lemons, limes, coconuts, avocados, mango, lychee and longon. We sell our fruit commercially to brokers in Canada, fruit stands on Kauai and local residents who come by to pick up their special orders. Our nursery supplies landscapers with exotic palms, tropical ornamental plants and fruit trees. We love our life here on the north shore of Kauai and enjoy the healthy lifestyle and unique sense of community that Kauai offers. We feel very fortunate to be able to offer visitors the unique experience of staying on a working organic tropical farm and nursery. Our farm is a labor of love and never ending work in progress. David purchased raw land in 1981 and planted orchards and gardens. Over the years his deep love for and study of the plant world has made him an expert on palms, cycads, flowering trees and fruit trees. We are world travelers and designed the Hideaway as a perfect getaway with everything we would be looking for in a home away from home. Our location is ideal in every way. Minutes to stunning beaches and Kilauea town, yet still in the country. Toilet, pedestal sink, linen and storage closet with door opening directly to a beautiful outdoor shower and bath area enclosed in a bamboo fence. Claw Foot Tub. No cooking facilities. Full size fridge and bar size sink. What a fabulous home away from home! Everything was clean and restfully colored. The fresh produce Lisa left for us was delicious. She thoughtfully left us yogurt and island granola to have for breakfast, too. Not only that, but there was snorkel gear, beach chairs, and beach towels all ready for us. Next to the jaw-dropping gorgeous location, the outdoor shower and tub were almost as amazing. What a delight! Mahalo for the kind hospitality!!! 3rd Stay in Three Years! My wife and I just returned from our third visit at The Garden Hideaway, and as was the case the prior two visits, this one was also exceptional. If you are looking for a beautiful place that is surrounded by trees and singing birds, The Garden Hideaway is the place to stay. It is located on a quite part of the island, making it an ideal place to relax. Lisa and David are amazing hosts. They are the kind and wonderful type of people you would like as neighbors. We look forward to another stay! Thank you, Dan, for your kind words! I'm so glad you appreciate everything we put into making sure our guests have a great experience at the Hideaway. It's always a pleasure to host you and Cassandra and we hope to see the two of you here again. The most beautiful and relaxing stay! Great stay at the Hideaway! I feel a good indicator of a great place to stay, is if you were forced to stay there and do nothing else, that would be okay. This was such a place. Of course, we were out and about, it's Kauai!...but we were just as content to stay and enjoy this lovely place full of beautiful natural sights and sounds. Plus, I don't think I've ever been so excited to take a shower or bath. Lisa and David left us with various yummy fresh foods, and David even picked us more oranges for the most delightful freshly squeezed orange juice. They were very good at providing us with lots of privacy while still being very informative. We would definitely stay here again! Reviews like this remind us why we love hosting guests at the little cottage on our farm. Yes,this island is amazingly picturesque with much to do, but the week you stayed here was pretty wet, even by Kauai standards. It's so nice to know that just kicking back at the Garden Hideaway was enough for the two of you. I'm so happy you enjoyed your time here! Mahalo for the lovely review! Garden Hideaway is a charming, very private, lovely bungalow set in a beautiful naturescape. It is convenient to a some good restaurants and great hikes or strolls. Lisa is a charming host and left lots of fresh fruit and macadamia nuts for us to enjoy. Thank you for your lovely review. I am so happy the two of you enjoyed your time at the Hideaway! Very nice place. Beautiful gardens. Very private. Lots of supplies amenities. One week minimum stay during Christmas and New Year Holiday.